You might call W.F. Strong a student of all things Texas. In 2010, he began sharing his 'Stories From Texas' vignettes on public radio stations, most recently on the Texas Standard news show's 30 stations. 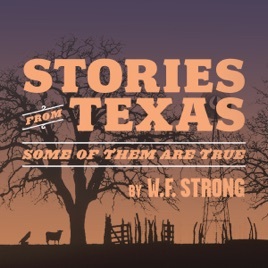 For this book celebrating his home state, Strong has collected 75 of his broadcasts. You'll hear his inimitably Texan voice in your mind's ear as he weaves stories on subjects ranging from how to ''talk Texan'' to Texas bards and troubadours; from tall Texas tales to Lone Star icons like Charles Goodnight, Tom Landry and Blue Bell ice cream; from legends and unsung heroes of the past to some heartfelt memories of his own. Strong agrees with John Steinbeck that ''Texas is a state of mind... a mystique closely approximating a religion,'' and every one of his stories embraces the Texas state of mind. Thanks WF Strong - great voice and entertaining stories - fun and informative. I will listen to this several times and will pass the stories along in conversations.